Designed for high-end graphics use, the FlexScan F980 represents EIZO's most advanced and feature rich CRT monitor to date. The 21 inch screen, high refresh rates, and fine dot pitch give CAD/CAM, DTP, and DIP professionals sharp focus, true color reproduction, and crisp text at high resolutions. Automatic Color Correction detects and automatically compensates for discrepancies in video signal output levels sent from the graphics card to assure accurate color temperature and brightness. Color correction also unifies color temperature when two computers are connected to the F980, even if the graphics cards and operating systems are different. The F980 utilizes a newly designed shadow mask CRT with an extremely fine dot pitch of 0.23 mm (horizontal pitch of 0.20 mm) for precision focus. A wide horizontal scanning frequency of 30-137 kHz allows for a recommended resolution of 1600 x 1200 at 109 Hz (addressable) and a maximum resolution of 2048 x 1536 at 85 Hz to increase the amount of information that can be displayed on the screen. 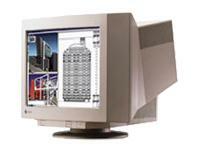 Product Description EIZO FlexScan F 980 - display - CRT - 21"